Ask Me Anything About Conference Panels — Thursday, July 21, 4-6 pm EDT Blab! Do you dread having to listen to one more boring panel? 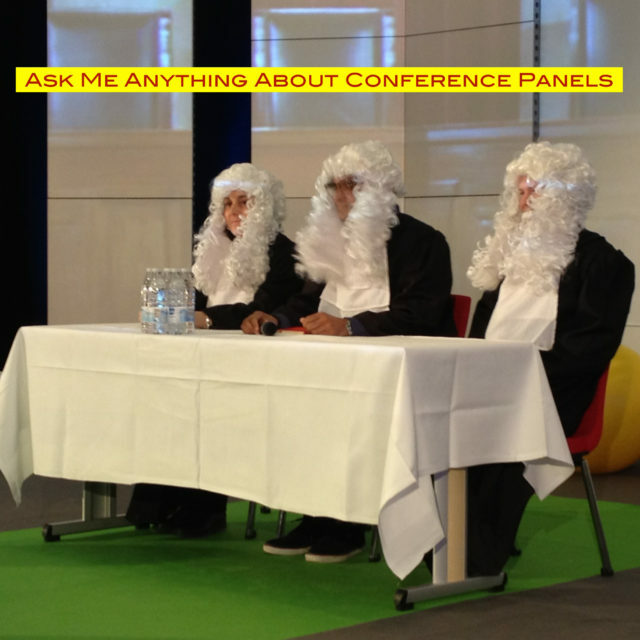 Have you been asked be a panel moderate or panelist, and wonder what to do? Do you want to learn how to make conference panels much, much better? Then we’ve got a Blab for you! After the success of our Ask Me Anything About Event Production Blab, I’m happy to announce we are running an Ask Me Anything About Conference Panels Blab this Thursday, 4 – 6 pm EDT on my weekly #Eventprofs Happy Hour (#ephh) with special guest Kristin Arnold. Hailed by MeetingsNet as the “Panel Improvement Evangelist”, Kristin is on a crusade to make ALL panel discussions more lively and informative. She’s the author of Powerful Panels: A Step-By-Step Guide to Moderating a Lively and Informative Panel Discussion at Meetings, Conference and Conventions, and has been moderating panel discussions for over twenty years. Among her other talents, Kristin has presented to over half a million people around the world, and retired from the US Coast Guard Reserves in 2002 as a Lieutenant Commander! Learn more about Kristin here. Kristin & I have more than a few opinions on conference panels. But we want yours too! Join the Blab at any time to ask questions, share your thoughts—and I might invite you to join us on the video stream. Expect a lively discussion and a lot of good information and ideas! To be reminded when the Blab begins, go here and click Subscribe. The same URL will take you to the Blab once we’re live. Never joined a Blab before? Here’s a good introductory Blab tutorial. Kristin & I look forward to your joining us on Thursday! This entry was posted on Tuesday, July 19th, 2016 at 11:47 am	and is filed under Online event. You can follow any responses to this entry through the RSS 2.0 feed.You can leave a response, or trackback from your own site.